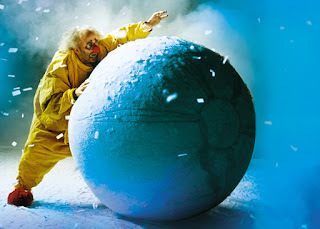 The word "awesome" is overused these days but it's the only way to accurately describe the astonishing spectacle that is Slava's Snowshow. This incredible piece is the creation of the world renowned clown Slava Polunin and it's clear to see why this joyous show has won accolades worldwide. From the moment you arrive in the theatre you are absorbed into the world of Slava, guided by deceptive lighting that gives a chilly appearance to a toasty warm auditorium. Even before the show began there were clouds of confetti filling the air as excitable children grabbed what they could from the floor and sent it spinning over their family and friends. Throughout the show awestruck gasps and irrepressible laughter rippled through the audience and even during the interval there was unexpected entertainment happening in the auditorium filling it with laughter and astonished squealing. What's wonderful about the universe that Slava has skilfully created is that it doesn't matter how old you are, it is awesome. The performers are brilliant, elegant and there is a real subtlety to their art. There is some real blink and you'll miss it split-second moments of definite genius. The only down side is that the show desperately lacks a clear narrative and as a result it is probably slightly out of the comfort zone of most regular theatregoers but your inner child will thank you for buying the ticket. Reviewing the show without spoiling the experience is nigh on impossible so you're going to have to trust us when we say that you won't have seen anything like this before and you'll be taking pocketfuls of it home with you whether you intend to or not. It's whimsical, absorbing, surprising and it's only in Glasgow until Saturday so book now before it melts away!